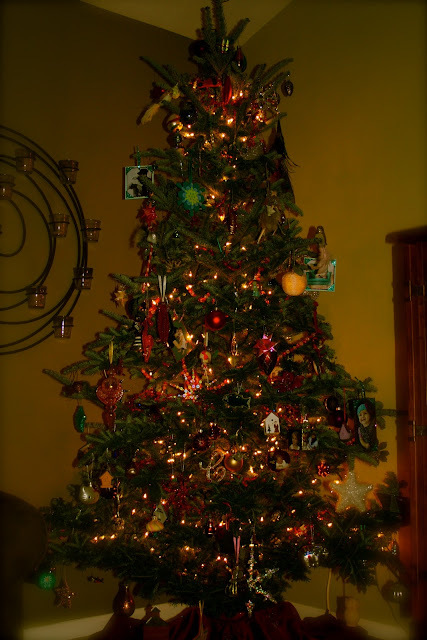 And.......the tree is up and decorated and twinkly and full of memories and conversations and laughs. Georgia loved the decorating this year--loved it. 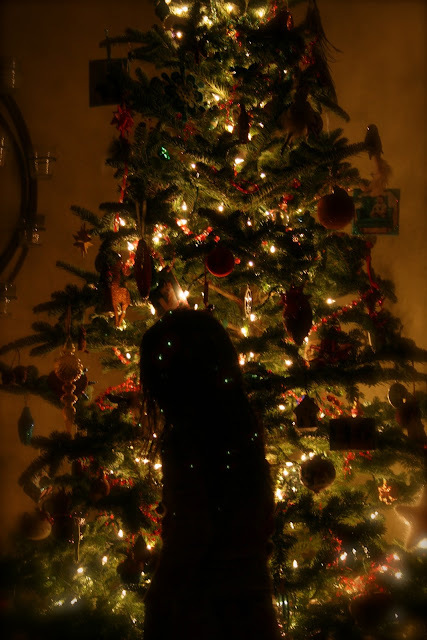 She wanted to hang every ornament on the same branch and she wanted to run with huge handfuls of glass and glitter and beads and metal hooks across the living room and throw it at the tree in excitement. She was on fire. Like I said yesterday....I really believe Christmas trees should be a representation of who you are as a family, a person, where you've been, what you did, what you've learned, and what is important to you. It's an amazing conversation piece in your home for the next month and lends itself to countless stories and reveling in family the way you should during the holidays. We danced tonight to the light of the Christmas tree (a little Cheetah girls Christmas--download it if you haven't already--I promise you'll love it). And we looked at some ornaments. And we had breakfast for dinner and it was a wonderful kick-off to drinking up all that the holidays afford and the memories they'll create. Super creepy loon (right? a loon?). My friend Liz and I spotted these at Macy's one year. For some reason I thought it was cool at the time. She wrapped this little beauty up and gave it me at Christmas. I laugh every time I put it on the tree--and you better believe it's going on the tree every year. Also from Liz--....we've been canceling out each others votes for the last two elections with pleasure. But she was kind enough to demonstrate her friendship by getting me an elephant. Ahhh--we have some great election memories, she's an amazing friend, and she deserves a place on my tree. This one's a keeper! From my friend Dawn who lives in Japan. She sent me this in 2003 when she first moved to Japan to teach. She's still there and I'm still here but I think about her whenever I hang this up and I told Georgia all about her today. We've been friends since before I can remember and we always will be no matter where we live or how long it is between visits and conversations. Georgia wanted to hang this up today and I snatched it out of her hands. It's maybe my favorite ornament. 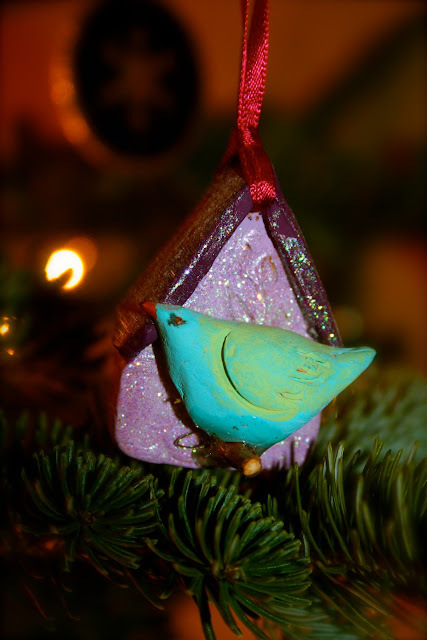 My mom gave it to me right after college when I was into collecting bird-houses and I love the iridescent glitter, the color of the birdhouse, and the contrast of the bird. No one hangs this up but me. It deserves a prime location! "If you wanna be my lover......." The first time Chris met my parents I was wearing skin tight silver plastic pants, a red bikini top, six inch platforms, and had spray painted my hair red. My floor-mates and I in college were the Spice Girls for our college Air Band competition. My room-mate at the time, Cherith, who helped come up with costumes, critiqued our rehearsals, and assisted in creating a 50 lb. Union Jack flag out of glitter and a navy blue flat sheet made these for each of us. It's not going anywhere. Georgia's adoption day anniversary ornament. Last year she loved bunnies. 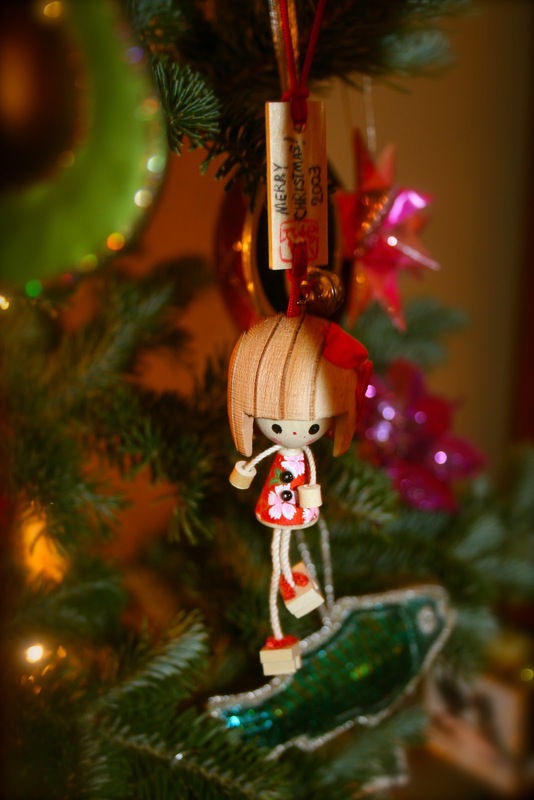 This year she told us she wished she had a Dora to hang on the tree. If only she knew what was tucked away in her closet for December 17th when we celebrate the second anniversary of her adoption day........if only. My mom makes these awesome photo boxes. The first one she gave to us the first Christmas we were married and she made the bottom one for Georgia to remember 2011. 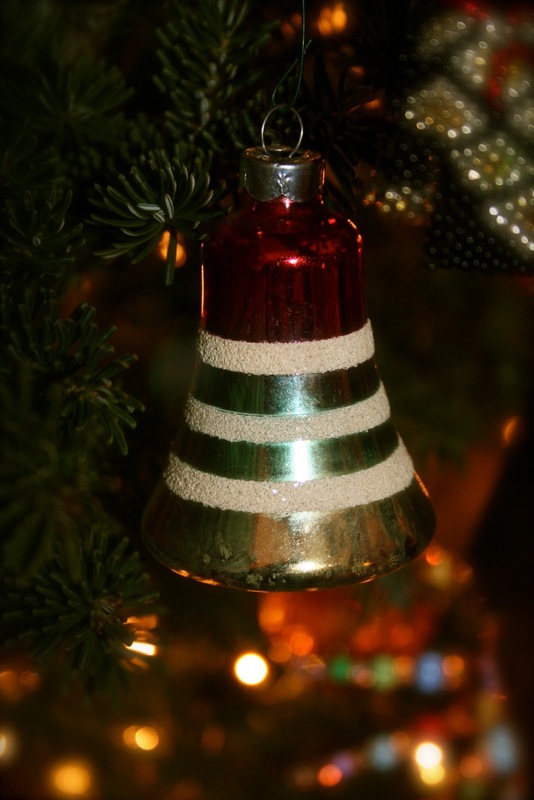 These are a must do DIY..... and ornament. Chris got this in Germany last spring. She is amazing. Her wings? If only I could find pipe cleaners like that. This was his first over-seas business trip and I couldn't be prouder of how hard he works and who he's become. My sister gave us this as a "thank-you" for adopting her cat. It's not cutting it El. As cute as this ornament is. "Baby's first Christmas" ornaments are pretty mediocre with all of their over-done pink and balloons and mice and white clouds. My mom to the rescue. She found a peach and made a Georgia Peach ornament and re-purposed this bottle to commemorate our first Christmas with G.
From our honey-moon. 'Nuff said. If you follow this blog and know my daughter--there is no explanation required. 2011= Hello Kitty EVERYTHING. This is vintage from my grandma. I love it. Days gone by, the greatest generation--all that. These were favors I made for Georgia's adoption day party. It was near Christmas and I thought everyone needed an ornament. We have about six on our tree. They're the best. And what's cooler--Georgia can tell you exactly what they're from. And every year my collection of memories grow and we try to make sure they are represented on our tree. When I left home my mom gave me a handful of ornaments to take with me.......tangible examples of the memories we had as a family.....objects to look at and know how loved I was and what my parents had given me......a strong foundation with which to begin building my own life (and my own ornament collection). And one day--I'll do it for Georgia. Ornaments are souvenirs to life and they should be displayed prominently for the few weeks it's acceptable to have a totem pole of them in your living room. And it's okay if trees are a little messy and haphazard and sometimes ornaments have to be picked back up and put on the tree--because that's what life is. The life that created and warranted all those ornaments. This is so great! 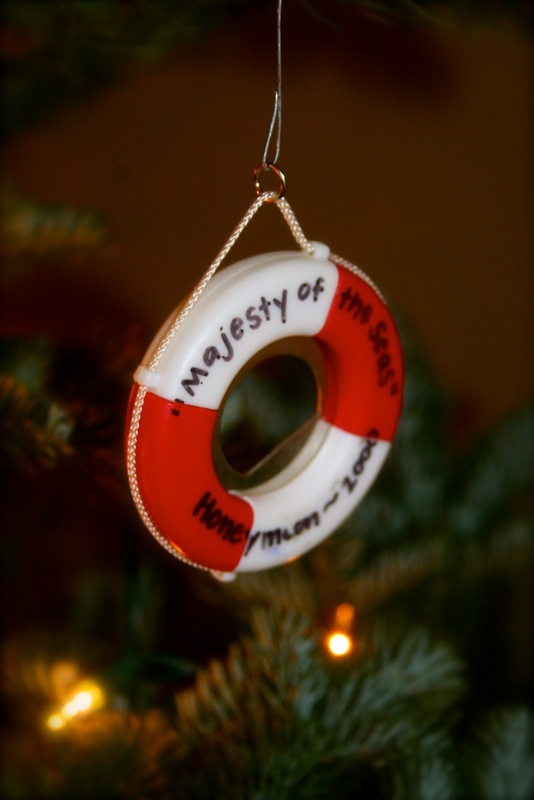 Most of our ornaments are this kind... full of memories. Love it. Makes me want to get a tree a little earlier this year. Found your blog through NaBloPoMo. Thank you so much for sharing the stories related to your ornaments. I completely agree that your tree should be a conversation piece. Thanks so much for being who you are and for sharing that!